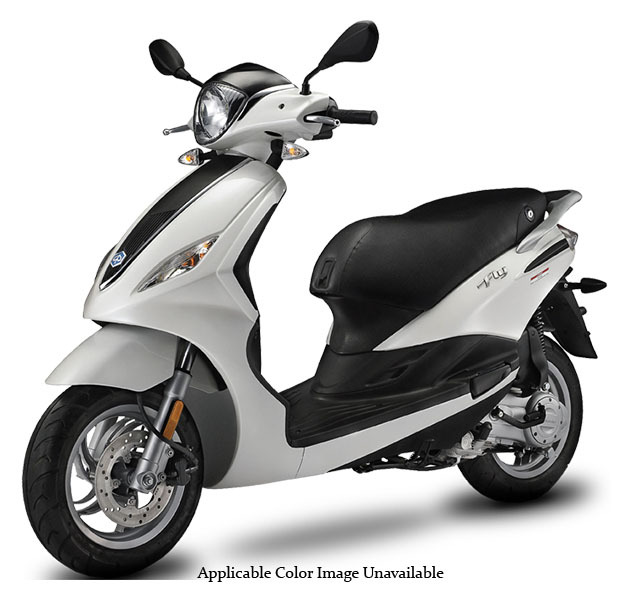 Whether you are new to two wheels, want to beat the commuter blues, or simply need a more economical mode of transport, the Fly 150 is the scooter that will suit your lifestyle. The Fly 150 is equipped with the super-efficient 3-valve 150cc engine that provides lower emissions, along with maximum performance and fuel economy of 104 mpg. With classic Italian style and endless comfort, the Fly 150 features telescopic hydraulic forks and 12" wheels with large tubeless tires for easy handling and safety on both urban and uneven roads. TWO HANDY AND VERSATILE STORAGE COMPARTMENTS: The Piaggio Fly comes with both a glove box in the rear shield, designed to hold documents and small objects, and a spacious compartment under the seat which can hold two flip-up helmets . Or, once your helmet is on your head and you’re on the road, you can easily store a small bag instead. In addition to all this, you can hang your backpack or shopping bag from the bag hook at the front of the seat or place them on the wide footrest.